This black knitted dip hem top from New Look is a winter wardrobe staple, it’s classy, stylish and modern. 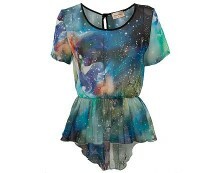 Update you current winter knits for a very trendy dipped hem version for only £5.00! This super top is lovely; it combines classic with modern in a very fine and comforting to wear knit that will keep you nice and snug during those chilly months. 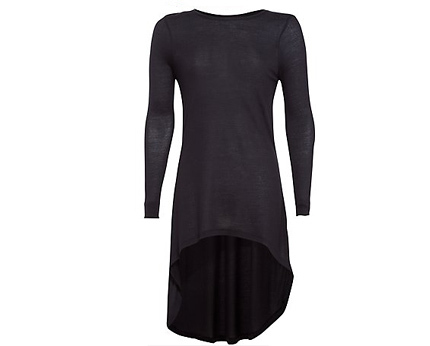 The longer length at the back allows this top to be worn as a jumper dress if you like, just team it with leggings or super thick black tights and knee boots and you have an easy to wear stylish everyday look. We love that because it’s a fine knit it can be worn comfortably underneath you winter jackets without the feeling of being trapped! The classic black allows this knit to be styled in many ways and can be dressed up or down with ease. Its lovely cut will flatter most shapes and sizes! 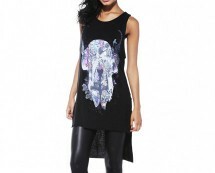 Prints are everywhere, and this skull print top is right on trend. 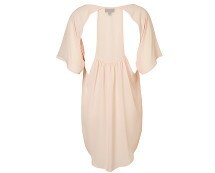 It has a straight drop back hem and in a loose fit team it with our jeans or denim shorts.